Dr. Jonathan Davis is the sole owner of Valley Veterinary Associates. He received his degree from Tufts University School of Veterinary Medicine in 1984. He first joined the practice when it was located in Franklin and moved with them to the Unadilla location in 1992. In 2004, he built the new facility on Route 7 between Unadilla and Sidney. His special interests are in theriogenology and surgery. He also owns and operates Milfer Farm, Inc. in Unadilla, one of the largest Thoroughbred breeding facilities in New York. Dr. Davis enjoys anything outdoors, including hiking, white water rafting and skiing. His dearest time is spent lumberjacking in the woods with his best canine friend, Hoppy. Hoppy is also one of Valley Veterinary Associates canine blood donors that has been attributed to saving many lives of critically ill patients that enter our hospital. Thank you Hoppy – Way to go! Dr. Jennifer Hamblin graduated from Ross University in 2002 and completed her clinical year of veterinary school at the University of Illinois. She has practiced at Valley Veterinary Associates since 2002. 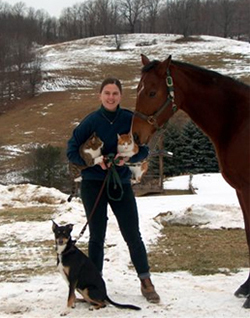 Her professional interests include equine medicine and sports medicine. In her spare time, Jennifer enjoys horseback riding, walking and fitness, cooking and baking. Dr. Elizabeth Wheeler is originally from Southern Vermont. She received a Bachelors of Science in Biology from Massachusetts College of Liberal Arts in Massachusetts, and a Master of Public Health from University of New England in Maine. She studied veterinary medicine at the Atlantic Veterinary College at the University of Prince Edward Island, graduated in 2018, and joined Valley Veterinary Associates. Elizabeth’s professional interested include bovine medicine, agriculture and canine behavior. In her free time, she enjoys gardening, crocheting, horseback riding and being outdoors. Contact Valley Veterinary Associates today at (607) 563-1345 to schedule your appointment, or browse our website for more information regarding our Equine & Farm Animal Services or Companion Animal Care Services.